It could be strongly argued the Western Pacific should have never been built. The WP was the longtime dream of Arthur Keddie who wanted to break the Southern Pacific's (SP) monopoly between San Francisco/Oakland and Salt Lake City. Such a project had been tried many times but noted tycoon Collis P. Huntington, who controlled the SP, used his influence to stop each attempt. Keddie finally outmaneuvered his nemesis by partnering with another mogul, George Gould. Together, they opened a competing line through the beautiful Feather River Canyon. For nearly 80 years Western Pacific moved freight along its well-engineered corridor that, in total, spanned slightly over 1,000 miles. Despite a route difficult to maintain it was operationally superior to the SP's former Central Pacific corridor over Donner Pass (part of the original Transcontinental Railroad). As a result, WP's 924-mile line remains in service today under successor Union Pacific. Although relatively small, the Western Pacific is remembered for many things; operating one of the most successful streamliners of all time, constructing the famous Keddie Wye, and maintaining the important "Inside Gateway." When completed in the early 20th century, the Western Pacific marked one of the last major projects of its kind ever undertaken. According to Brian Solomon's book, "Southern Pacific Railroad," the very first "Western Pacific Railroad Company" dates back to the Transcontinental Railroad, incorporated on December 13, 1862 by Collis Huntington to give the then-Central Pacific Railroad (CP) direct access into the Bay Area. 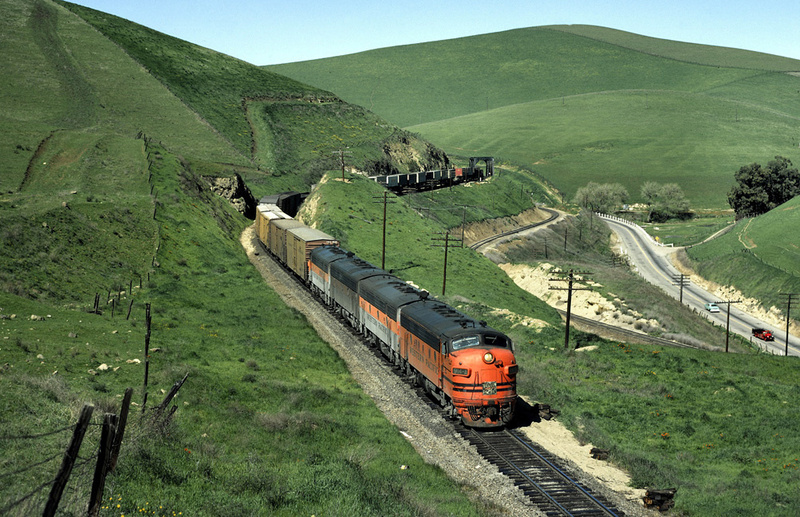 The line, which opened on November 2, 1869, ran from a CP connection at Sacramento to Niles via Tracy and Altamont Pass. From Niles, the line split in opposite directions, reaching Oakland and San Jose. 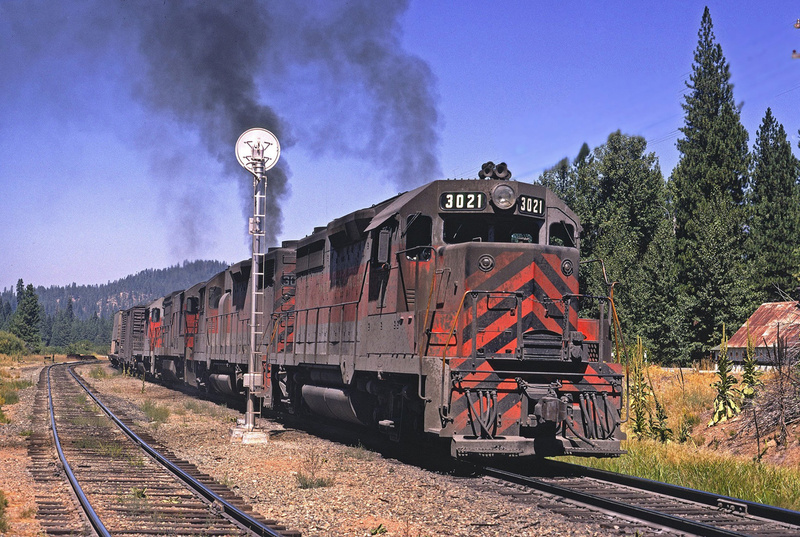 The original WP operated a total of 151.06 miles and was merged into the CP on June 23, 1870. Huntington and his fellow businessmen, Leland Stanford, Mark Hopkins, and Charles Crocker ("The Big Four"), added another corporate layer to their growing empire when the Southern Pacific Company was formed on August 14, 1884 to manage all properties under their direction. The SP went on to blossom into one of the West's most powerful railroads and denied any attempts at a second transcontinental connection at Salt Lake City. In his book, "More Classic American Railroads," author Mike Schafer notes how Arthur Keddie was the most persistent. 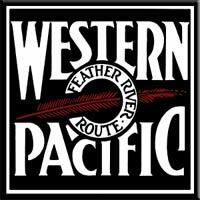 Denver & Rio Grande Western, "Mainline Thru The Rockies"
The modern WP's beginnings are symbolic of its entire corporate existence; always fighting for survival. Keddie's first effort was the Oroville & Virginia City Railroad launched in 1869. However, the "Big Four" quickly used their leverage to end this threat by turning investors away and successfully lobbying Congress to deny it land grants. Several years later, Keddie tried a second time when he helped establish the San Francisco & Great Salt Lake Railroad, incorporated on May 21, 1892. Alas, this scheme met a similar fate. Still undeterred and with great enthusiasm, Keddie continued his assault on the "Big Four" by incorporating the Stockton & Beckwith Pass Railway in 1902. This latest idea planned to link Stockton with Oroville (via Sacramento) before continuing northeastward through Beckwourth Pass, following the Feather River much of the way. They say timing is everything and as Keddie's latest venture got underway, George Gould entered the picture. The son of legendary mogul, Jay Gould, he was then working to complete his late father's dream of a true, coast-to-coast railroad. By the 20th Century his goal was nearing reality as he controlled the Missouri Pacific, Wabash, Western Maryland, Wheeling & Lake Erie, and the Rio Grande properties consisting of the Denver & Rio Grande (D&RG) and Rio Grande Western (RGW). To reach the west coast he formed two small railroads, the Indian Valley and Butte & Plumas, which would build through the Feather River and link up with his Rio Grande systems at Salt Lake City. After he realized Keddie's intentions the two men joined forces to create the Western Pacific Railway on March 3, 1903. By then, Collis Huntington and his former associates had died with the Southern Pacific passing into the hands of another successful tycoon, Edward Harriman. Just like the "Big Four" he had no interest in sharing his railroad's monopoly but with Gould's support and financial backing the Western Pacific project moved forward. According to James Griffin's book, "Rio Grande Railroad," Gould used his D&RG/RGW railroads to finance Western Pacific's enormous construction costs (the two would contribute a total of $31.5 million to the endeavor, or roughly 40%). With financing secured, construction crews began from both ends; to the west, track-laying launched from Oroville, California on January 1, 1906 while work commenced in the east from Salt Lake City on May 5th. While the route avoided the treacherous steep granite cliffs found along Donner Pass, the Feather River carried its own difficulties. The canyon was extremely rugged with unstable rock that caused many slides. In addition, the region's remote and desolate nature only compounded problems. In the end, Gould and Keddie were rewarded for choosing the river as it afforded much easier grades, resulting in lower operational costs (Union Pacific even spent $30 million to rebuild the route in 1997 after landslides placed 100 miles out of service). As Mr. Schafer's book points out, whereas Southern Pacific's Donner Pass sat at an elevation of 7,056 feet and received roughly 200 inches of snow annually, Beckwourth Pass carried an elevation of just 5,221 feet and was situated fully below the snow line. Another benefit was the difference in grades; Donner ranged from between 1% to 2.3% during an 80-mile stretch while Beckwourth's never exceeded 1%. The only trade-off was in overall length with Southern Pacific's line some 138 miles shorter (786 miles compared to Western Pacific's 924 miles). During the four years of construction, work was slow but steady. 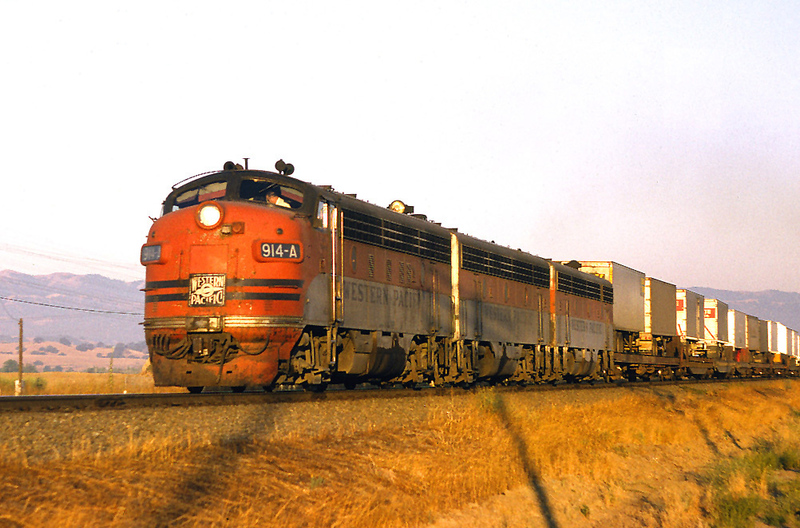 The main line boasted several noteworthy engineering feats as Donald Robertson points out in his book, "Encyclopedia Of Western Railroad History, Volume IV: California." 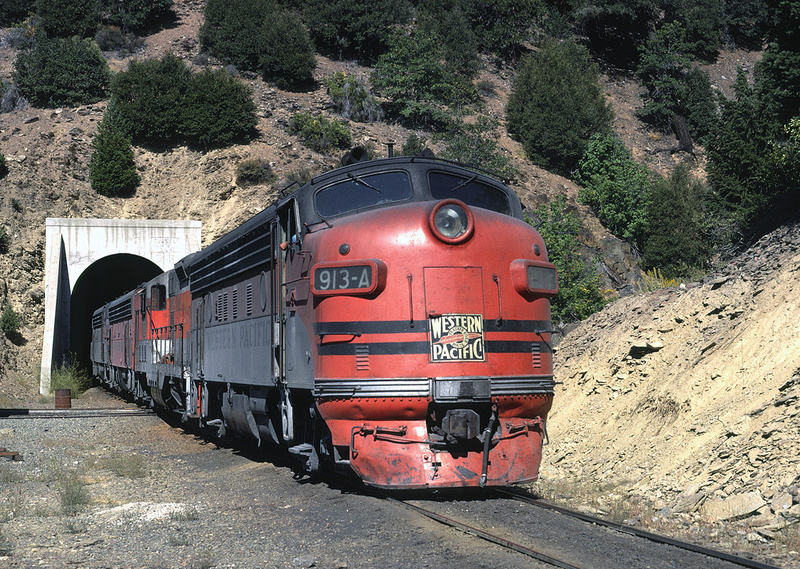 These included 43 tunnels ranging in length from 58 to 7,318 feet (the longest included a 5,676 bore near Jasper, Nevada; a 6,000-foot tunnel at Chilcoot beneath the Sierra Nevada Mountains; a 7,318-foot tunnel at Spring Garden; and finally a 4,287-foot tunnel at Niles Canyon) and a number of trestles spanning the Feather, American, and Humboldt Rivers. The first major accomplishment took place on November 9, 1908 when a connection was established with the Nevada Northern Railway at Shafter, Nevada. This interchange enabled originating shipments of copper ore to be transported east to Salt Lake City. Finally, on November 1, 1909 a Golden Spike ceremony was held within the Feather River Canyon at Keddie, California marking the railroad's formal completion. Regularly scheduled freight service commenced on December 1st that year while passenger service launched several months later on August 22, 1910. Contractors officially turned over the property to the operating department on July 1, 1911. Altogether, the WP had cost a total of $60 million. Unfortunately, without a strong freight base and few feeder branches, monetary issues materialized almost immediately. Within a decade the company was in trouble and entered bankruptcy prior to World War I. It was reorganized as the Western Pacific Railroad on June 16, 1916. The new company took over on July 15th and its new president, Charles Levey, worked very hard to increase business. First, he opened a branch to nearby San Jose and then acquired 64 miles of the narrow-gauge Nevada-California-Oregon Railway (N-C-O) on June 17, 1917. At a price tag of $700,000 this trackage provided WP access into Reno from a connection along the main line at Reno Junction (near Chat). The deal also comprised a northern component reaching Hackstaff (Herlong), California as well as N-C-O's western branch to Clio. As historian Dr. George Hilton notes in his book, "American Narrow Gauge Railroads," the N-C-O began as "The Nevada & Oregon Railroad," organized on June 1, 1880. 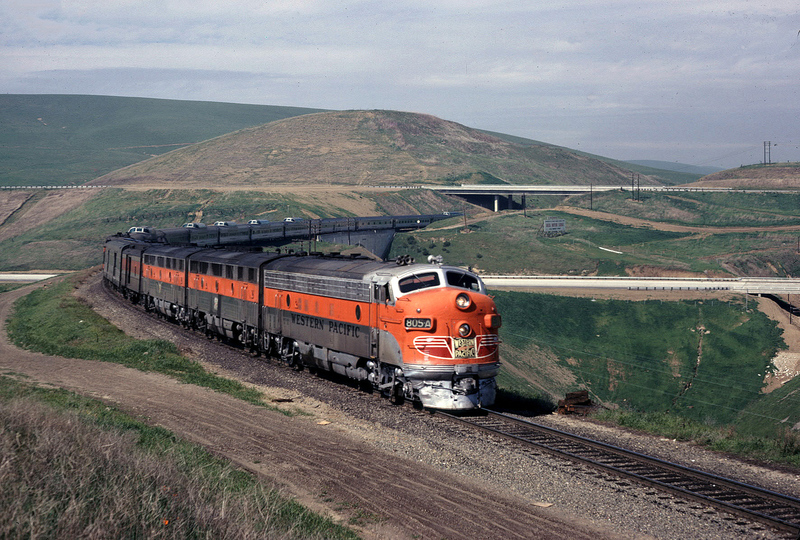 It was intended to interchange with the Central Pacific at Reno and act as a bridge line connecting Northern California with the Pacific Northwest (at The Dalles, Oregon) while circumventing the Sierra-Nevada and Cascade Mountains. Another route was projected to run south of Reno but no serious efforts were ever carried out on this extension. Nevertheless, the project carried enough clout and financial backing that it eventually opened a 238-mile main line and 32-mile branch. Following a few name changes it became the Nevada-California-Oregon Railway on January 1, 1893. It reached its final length on January 10, 1912 when it opened to Lakeview, Oregon. After a short legal battle the N-C-O acquired full control of the so-called Plumas Branch on January 1, 1915, a lumber spur that ran 32 miles from Plumas Junction to Clio. With no further construction undertaken, it subsisted primarily on livestock and grain traffic, along with the aforementioned timber business. After the WP acquired the southern segment it was quickly converted to standard gauge, completing the process on January 30, 1918. Later that year it abandoned the parallel Plumas Branch and dropped the 28-mile northern component to Hackstaff (in 1926 the Southern Pacific picked up the remainder of the N-C-O property). Levey's other notable endeavors included acquisition of a pair of interurbans; the Sacramento Northern Railway (SN) and Tidewater Southern Railway (TS). According to Dr. George Hilton's and John Due's book, "The Electric Interurban Railways In America," the SN was composed primarily of two predecessors, the Northern Electric Railway and the Oakland, Antioch & Eastern Railway. 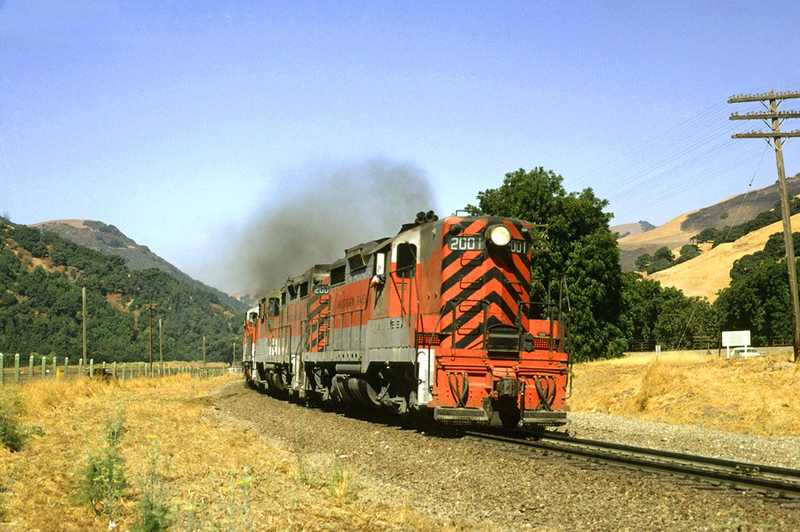 The former constituted SN's "Northern Division" while the latter its southern routes to Oakland/San Francisco. The Northern Electric was incorporated in 1905 and later purchased the Chico Electric Railway (1906), a small streetcar system serving its namesake community. The NE was funded and promoted by H.A. Butters who quickly eyed a connection into Sacramento. Running via Oroville and Marysville this link was established in September, 1907. Afterwards, a series of freight branches were added reaching Hamilton City (October, 1907), Woodland (July, 1912), and Colusa (June, 1913). Overall, the Northern Electric operated about 93 miles. Sacramento Northern's "Southern Division" was the work of the Oakland & Antioch Railway. This interurban was funded by a San Francisco businessmen and its name soon changed as the Oakland, Antioch & Eastern. It began from Bay Point, near Oakland, where a connection was achieved with the Atchison, Topeka & Santa Fe (Santa Fe) and progressed eastward. In 1910 the OA&E reached Walnut and a year later was opened to Lafayette. By early April, 1913 it had extended to Sacramento and a connection with the Northern Electric. The OA&E was hampered by a rugged profile due to its crossing of the Coast Range, requiring grades of 3% and 3,500-foot tunnel. The Sacramento Northern Railroad was created in 1914 when the NE went into receivership. Just six years later the OA&E found itself in a similar predicament and was renamed as the San Francisco-Sacramento Railroad (the so-called "Sacramento Short Line"). In 1922 Western Pacific acquired the SN for its freight business, adding the Sacramento Short Line in 1927 for the same purpose. A year later, the Sacramento Northern Railway was formed as a holding company, which later merged all WP's interurbans under this name. The new company continued to grow by opening branches to Clarksburg, Oxford and then reached downtown San Francisco via the new Bay Bridge in January, 1939. 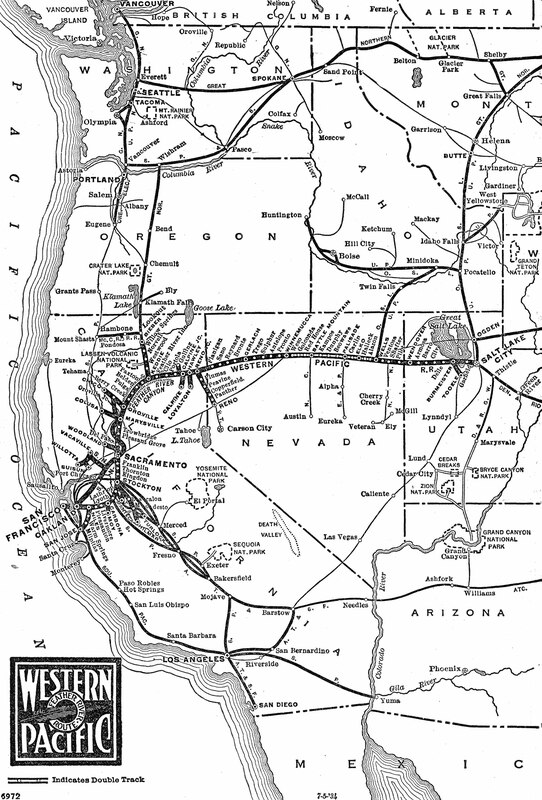 At its peak, the Sacramento Northern maintained a network of 183 miles. The nearby Tidewater Southern joined Western Pacific as another freight line. It began construction in 1911 and opened from Stockton to Modesto as a standard, steam-powered system in October, 1912. A year later electrified service was initiated (November 15, 1913). By 1918 it added three non-electrified branches reaching Turlock, Hatch, and Manteca that were designed solely for freight traffic. The Western Pacific acquired the road in 1917 and it provided considerable business, largely in the areas of fruits, vegetables, and serving local wine producers. In spite of the Great Depression's onset, the Western Pacific continued improvements where it could. The most notable was establishing a link with the Great Northern through a joint project known as the "High Line," "Inside Gateway," or "Northern California Extension." According to the book "The Great Northern Railway, A History" by authors Ralph W. Hidy, Muriel E. Hidy, Roy V. Scott, and Don L. Hofsommer, a formal Golden Spike ceremony was held in Bieber, California on November 10, 1931 marking the occasion. The new corridor handled freight from San Francisco/Oakland to the Pacific Northwest, and ultimately Chicago in competition against the SP. WP's section included 111.8 miles running north from Keddie, a junction where two spectacular bridges and a short tunnel were completed to form a wye off the main line. While the railroad boasted stunning scenery and the lowest grades through the Sierra Range, profits did not reflect these attributes. Not only did the Feather River Canyon's unstable geography frustrate the railroad (with numerous mud and rock slides) but strong competition from the Southern Pacific hampered potential. In 1935 it experienced another bankruptcy but World War II witnessed record traffic which finally offered some consistency. At this time the Western Pacific enjoyed its greatest extent, operating a network of 1,138 route miles. The 1950's brought excellent leadership, beginning with Frederic B. Whitman. S2 552 (2nd) 5/1949 1 (Built as Missouri Pacific #9129. Acquired on 2/12/1970. * #922A became #918A (2nd) in 9/1971. Thanks to the book, "Western Pacific Color Pictorial: Volume One," by Adam Clegg for help compiling this diesel roster. * United States Railroad Administration (USRA) "Light Mikados" which were sold to the Wabash in 1920. He oversaw a number of improvements such as installation of centralized traffic control (CTC) and acquisition of diesel locomotives for main line service (the second railroad to acquire such, behind only the Santa Fe). On March 20, 1949 it introduced one of the most successful and fondly remembered streamliners of all time, the California Zephyr (CZ). As a joint endeavor with the Rio Grande and Chicago, Burlington & Quincy, the train whisked travelers from Chicago to Oakland/San Francisco offering top-notch services and incredible views of the American West. The CZ was still witnessing relatively strong ridership when an ailing Western Pacific elected to cancel its leg on March 22, 1970. Other presidents such as Alfred Pearlman, an excellent railroader in his own right, followed Whitman and carried the company through that troubled decade. It was the industry's deregulation in 1980 which, ironically, closed the book on the storied Western Pacific. A series of mergers left the railroad as a small fish in a huge pond, surrounded by giants like Union Pacific, Southern Pacific, and Burlington Northern. Needing to find a partner, Union Pacific offered to purchase its much smaller counterpart and the acquisition was made official on December 22, 1982. Today, the Western Pacific may no longer exist but its legacy lives on through the Feather River Route, Keddie Wye, "Inside Gateway" and the California Zephyr, the name of which survives under Amtrak (albeit following a slightly altered route). In addition, Union Pacific has honored the railroad by painting SD70ACe #1983 with an inspired Western Pacific livery.